Shop ThinkGeek, online at ThinkGeek.com, for novelty gifts, geek toys, electronics, apparel, and all-around fun gadgets. If you love technology, internet culture, computers, toys, and cool things in general, you will love ThinkGeek. Find science toys, puzzles, fun office supplies, or even caffeinated edibles at ThinkGeek. For the admitted partial-geek or full-blown geek, or the geek in denial, or perhaps even the non-geek, ThinkGeek is the perfect place to make life a little more exciting. Be sure to check RetailSteal.com for ThinkGeek coupons, ThinkGeek discounts, and ThinkGeek promotions. 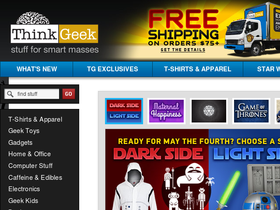 ThinkGeek ships domestically and internationally. Return item within 30 days of ship date for refund. Check site for full details, exclusions may apply. Sign up today with ThinkGeek for up to 10% off special offers. Shop over 300+ sale items at ThinkGeek to find savings of up to 75%. Click link for savings. Shop online at ThinkGeek.com and enjoy free shipping with your order of $50+. Shop new arrivals at ThinkGeek starting at $14.99. Click link now and shop. Shop the clearance at ThinkGeek to save up to 50% on select items. ThinkGeek offers items for as low as $0.99. Click link to place order. Find BuckyBalls for $24.99 at ThinkGeek. Click link to save.